Home automation is "The Internet of Things". It simply means the way all devices or appliances are networked together to provide customers with a seamless control over their home equipment. Sonoff is a cost effective, smart home solution which is designed and produced by ITEAD. It is a low-cost solution that helps you to step into the amazing smart home. Sonoff smart home series are based on WiFi that can connect to appliances of different types and brands. Sonoff transmits data to a cloud platform through the WiFi router, which enables customers to remotely control all the connected appliances. SUPLA-CLOUD is a central point joining the executive devices for indirect and direct operation of your household or office appliances and other elements with client applications which you can install on your tablets and smartphones. 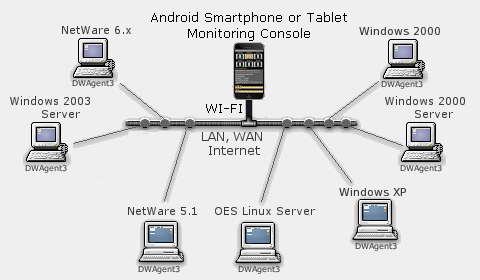 This software allows to operate, from one spot, the whole system infrastructure using any modern Internet browser. Server access is free of charge. You can also set up your own independent server working within the Internet or home network using system sources which you can download from GITHUB. Temperature and Humidity Monitoring WiFi Smart Switch. WiFi Switch with Power Consumption Measurement. WiFi Switch with Power Consumption Measurement, release R2. An ideal complement to other expensive and sophisticated control systems based on SNMP protocol. Every administrator managing servers knows how important is to get an early warning that free space of discs and server volumes decreases dangerously. This infomation is specially important as it refers to system volume SYS or another volume where are stored important data. VOLMON it is a program for monitoring of a volumes occupation of servers working on a NetWare platform. VOLMON controls a state of volumes in a real time, that makes him an indispensable tool in every-day work of server Netware administrators. and stations which are logged on to the server at midnight of every day. AUDITLGN is dedicated for servers working on the NetWare platform version 5.0, 5.1, 6.0, 6.5 and Nterprise Branch Office V2.0. Module SENDMAG.NLM is designed for remote turning on the workstations and other servers from the NetWare server level. This program sends so called MAGIC PACKET to a computer which is to be switched on remotely. SENDMAG is dedicated for servers working on the NetWare platform version 5.0, 5.1, 6.0 and 6.5. Module LSENDMAG is designed for remote turning on the workstations and other servers from the Suse Linux server level. This program sends so called MAGIC PACKET to a computer which is to be switched on remotely. LSENDMAG is dedicated for servers and workstations working on the SUSE Linux platform (SLES9, SLES10, OES Linux). SQLSRW9.NLM module is designed to archiving of Sybase SQL Anywhere Server 9 database files. SQLSRW9 is dedicated for servers working on the NetWare platform version 5.1, 6.0 and 6.5. SQLSRW10.NLM module is designed to archiving of Sybase SQL Anywhere Server 10 database files. SQLSRW10 is dedicated for servers working on the NetWare platform version 5.1SP8, 6.0 and 6.5.